Tiberius, the reluctant emperor, who ruled the Roman Empire from 14 AD to 37 AD, made his summer residence in Sperlonga south of Rome. Archaeologists have found a series of sculptures in the villa's grotto that reveal a taste for Hellenic art and the adventures of Homeric hero Odysseus. Sperlonga is just a few hundred kilometres south of Rome, between the towns of Gaeta and Terracina. 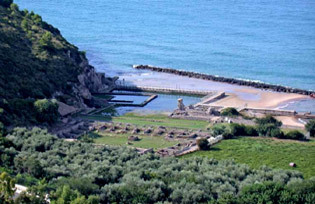 The Emperor Tiberius chose this site for his summer residence: a beautiful natural setting right on the sea. Signs of human life have been found dating from the Upper Palaeolithic era and according to tradition, this is the site where Amyclae, the mythical city of the Spartans, was built. Today the only visible remains of the imperial villa are a few rooms surrounding a courtyard, a bread oven and a kiln. 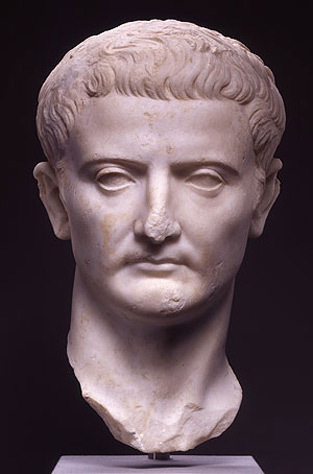 Tiberius began his reign as a rather unpopular and sour leader who was respected but generally disliked for his “arrogance and inscrutable looks” according to the Roman historian, Tacitus. He had a reputation for being a dark, reclusive, and sombre ruler who never had any desire to be emperor. Pliny the Elder called him tristissimus hominum, (the gloomiest of men). Adopted by the Emperor Augustus, it was uncharitably suggested at the time that Augustus’ gesture served merely to give greater dignity and resonance to his own reign by following it with that of Tiberius – which was sure to be a disaster by comparison. Tiberius’s early reign was characterised by a certain diffidence on his part, expecting the Senate to run the country without his having to interfere continually. He wanted to appear as a servant of the state and not as an emperor. His reluctance to participate merely led to confusion and mis-communication between him and the Senate. A good way into his reign Tiberius abandoned Rome, (some say shirking his imperial responsibilities), soon after losing his two sons, Drusus and Germaniscus and he never returned, making his home in his now famous villa in Capri. Interestingly, as a young man he had also retired from life and went to Rhodes to live as a recluse – he was clearly not one for human company. “But after being bereft of both his sons,— Germanicus had died in Syria and Drusus at Rome,— he retired to Campania, and almost everyone firmly believed and openly declared that he would never come back, but would soon die there. And both predictions were all but fulfilled; for he did not return again to Rome, and it chanced a few days later that as he was dining near Tarracina in a villa called the Grotto, many huge rocks fell from the ceiling and crushed a number of the guests and servants, while the emperor himself had a narrow escape”. There is an interesting story that when the rocks from the top of the grotto (not the ceiling as Seutonius suggests) fell on to the guests, Tiberius was saved by Sejanus who covered the Emperor’s body with his own, while others merely ran for their lives. Sejanus was rewarded for his loyalty – he eventually became the head of the Praetorian Guard and was offered many honours and favours. He ended up even dreaming of succeeding the Emperor – who had him killed for his presumption. He acquired a reputation for still grosser depravities that one can hardly bear to tell or be told, let alone believe. For example, he trained little boys (whom he termed tiddlers) to crawl between his thighs when he went swimming and tease him with their licks and nibbles…. (and it gets worse). And if that were not enough: “Then in Capri’s woods and groves he arranged a number of nooks of venery where boys and girls got up as Pans and nymphs solicited outside bowers and grottoes: people openly called this “the old goat’s garden,” punning on the island’s name”. Suetonius was somewhat overly fixated with the sexual aspects of Tiberius’ degeneracy in the same way that Tacitus’ criticisms were specifically anti-imperial as he was still nostalgic for Republican Rome. Both historians need to be read with caution. Tiberius also earned himself a reputation for being bloodthirsty, mean and subject to bouts of paranoia. So much so that upon his death there was general rejoicing – with crowds shouting “Tiberius to the Tiber!” (a fate normally reserved for criminals). In fact the story goes that he had appeared to die triggering general relief and rejoicing but then came back to life and asked for something to eat. The quick-witted head of the Praetorian guard, Macro, promptly took a blanket, or pillow, and suffocated the old Emperor to put an end to him. So much for Tiberius’ personal history. Let us now take a look at the summer residence itself and particularly the adjacent grotto. The actual name of Sperlonga, derives from the Latin Spelunca meaning cavern, and refers to the natural grotto set just a few metres from the sea. Left substantially unchanged by the Emperor, the structure of the grotto was only embellished by the addition of benches along the walls, and mascheroni (grotesque masks) which served as lamp holders for the cave’s illumination. A circular pool (diameter 21.90m.) 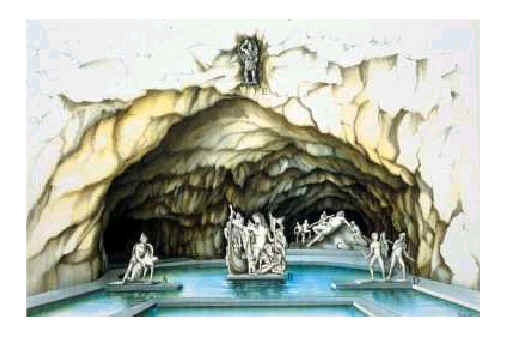 was dug out in the centre of the grotto and featured a Scylla sculpture mounted on a square base in the middle. 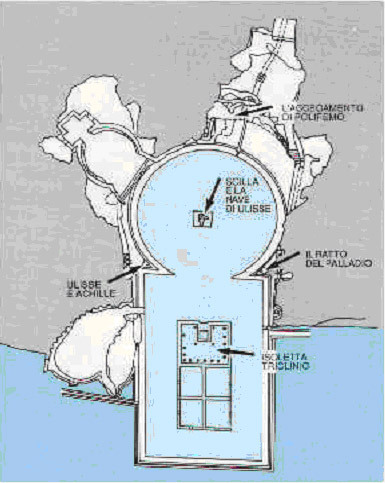 This pool was then extended 30m towards the north-west (and the sea) in a rectangular shape. These pools were divided by two platforms upon which stood two statues: the “Theft of the Palladium” and the Pasquino (so called as it is another copy of the original Greek statue which was the model for the famous Pasquino near Rome’s Piazza Navona). The entire iconographic scheme of the villa, and particularly that of the grotto, is linked to the myth of Odysseus. Artefacts have been identified in the grotto that represent events from prior to the Trojan War up until the adventures of the νόστος (the return voyage from Troy) of Homer’s hero Odysseus. Inside the grotto stood the sculptural masterpiece of the age, the Polyphemus group, a work renowned both for its sophistication and its size. It is currently at the Museo archeologico di Sperlonga where it can be admired in all its glory, thanks to a full-size reconstruction in plaster and resin. The scene is that of the famous blinding of Polyphemus by Odysseus. The cyclops is depicted reclining on a rock, dead drunk and completely at the mercy of his adversaries, who nonetheless move around him cautiously. Odysseus, identifiable by his characteristic pileus (pointed cap), guides the attack with fierce concentration. It is he who climbs towards the cyclops’ massive head to make sure that the incandescent stake goes right into the monster’s one and only eye. Two of his companions help support the weight of the long stake, while the third seems to retreat from the giant, holding a wineskin in one hand and raising his other arm as if to shield himself. Plaster reconstruction of the Polyphemus statuary group, Museo Archeologico di Sperlonga. This sculpture has been the subject of endless learned discussion, however the latest studies tend to identify it as a marble copy of a bronze statuary group from Tiberius’ time. The sculptors apparently opted for a symbolic/condensed version of the tale, as Odysseus was accompanied by a much greater number of fellow adventurers according to the IX book of the Odyssey. The original position of the statuary group is still the subject of controversy: even highly qualified experts like Coarelli, Hampe and Andreae, just to cite the most well-known, have argued for and against a variety of possible collocations, changing their minds several times. 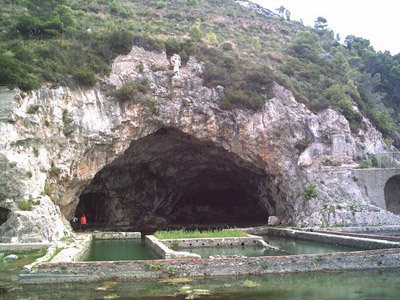 I won’t bore you with all the various debates on the subject, but personally I agree with Bernard Andreae’s most recent thesis (based on indications from Italian archaeologist Salza Prina Ricotti) which locates the Polyphemus group at the entrance to the southern section of the grotto. Recently, it has been ascertained that the Polyphemus on show in the museum is not a completely faithful reconstruction of the original : there are three missing details! 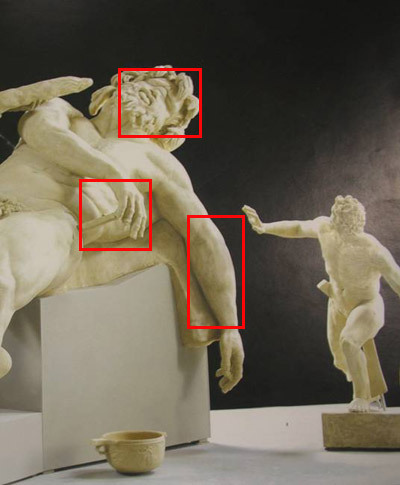 The first concerns the position of the hand and arm lying across the cyclops’ hips – the hand should instead be suspended in mid-air as though coming down to rest on the stomach. The head should be tilted further back and the left arm should hang closer to the body. In other words, the cyclops of the original was not already asleep, but was immortalized in the act of falling asleep. 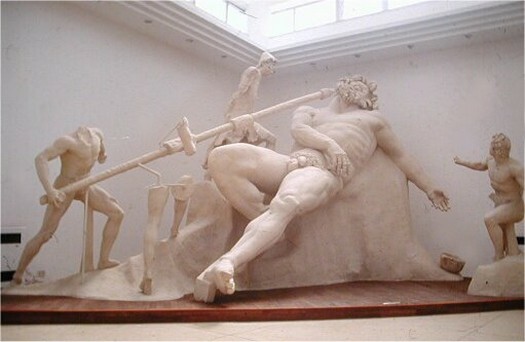 The reconstruction of the Polyphemus statue currently on show at the Museo Archeologico di Sperlonga. The blinding of Polyphemus was a recurrent theme used in the decoration of grottoes and nymphaeums – it became so popular that no aristocratic residence could be without one. 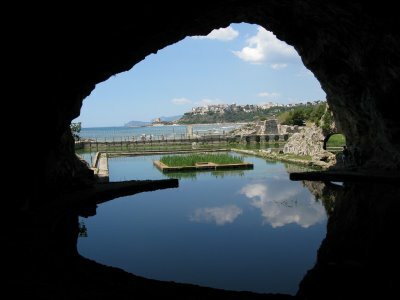 Apart from the statue in the grotto at Sperlonga, other famous examples can be found in the sunken nymphaeum of Punta Epitaffio under the sea at Baia, near Naples, in the antrum cyclopis of the Domus Aurea in Rome and in Hadrian’s Villa at Tivoli. The great novelty of the Sperlonga grotto, which was then imitated in all subsequent Imperial villas, was the adoption of statuary groups copied from Hellenic originals. These Hellenic-inspired statues no longer simply represented just one precise event, but rather a temporal continuum where past, present and future were subtly linked. In the Sperlonga Polyphemus group, the atmosphere is laden with tension, expressed by the dynamic stance of the protagonists which in turn evokes their earlier Homeric adventures. At the same time, our attention is focused on the dramatic action they are about to undertake. 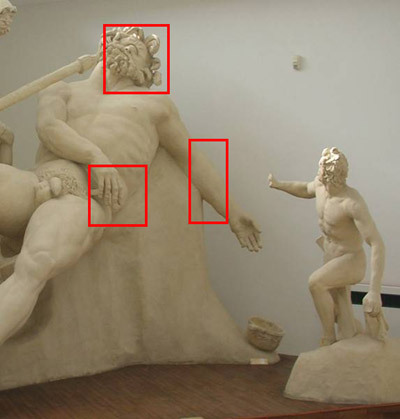 The anatomical and muscular details are finely and accurately drawn, and although the heads have been lost, thanks to comparisons made with the Polyphemus group at Hadrian’s Villa, we know that the protagonists were mature men, their careworn faces framed by untidy locks and unkempt beards. With necks violently twisted, and eyes sunken in their skulls, the half-open mouths express all their suffering and terror. The figure of Odysseus stands out from the rest of the group – the remarkable quality recalling that of the frieze on the Pergamon altar. 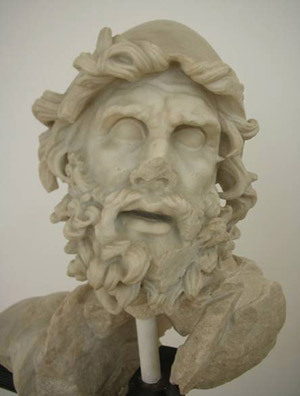 With his brow creased in a frown, eyes sunken, and mouth half-open, his unruly locks and wild beard in perfect contrast with his smooth pileus, this statue is one of the highest expressions of Middle/Late Hellenic art and the quintessential statue of Odysseus.